Representing creditors and landlords throughout Delaware since 1995. 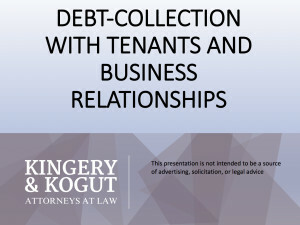 Clients include small businesses, credit unions, banks, homeowner associations, commercial and residential landlords, colleges, judgment creditors, debt buyers and individual lenders. Our experienced staff excels at skip tracing, commercial and consumer debt litigation, evictions, collection of back rent, and post-judgment execution. We keep our clients informed with regular progress reports, and we remit collected funds promptly. Contact Name: Angeline M. Kogut, Esq. Hard money loans available at member rates. Your best deal for money. Founded in 2009, DelREIA is the area's best community for real estate investors. Our complete list of DelREIA Members who are also service providers. Join our social community where Members share valuable information.